Stadium subsidies are a waste of public funds, according to polls of both the general public and and economists. Amidst this nearly universal disdain, politicians have found inventive shell games that cloak colossal giveaways of taxpayer resources to billionaire sports team owners. Two of these charades have already been hinted at in news reports about what officials from the District and Maryland are offering to NFL team owner Dan Snyder in their respective secret negotiations about a deal for a new football stadium. Hogan told reporters that “we’re not going to build a billionaire a stadium,” but conveniently left the door open to the state paying for infrastructure to and around the site—the same deal offered to build what's now FedEx Field. It's akin to winning a week-long free getaway on a tropical island, and then finding out that the flight to get there costs $10,000. 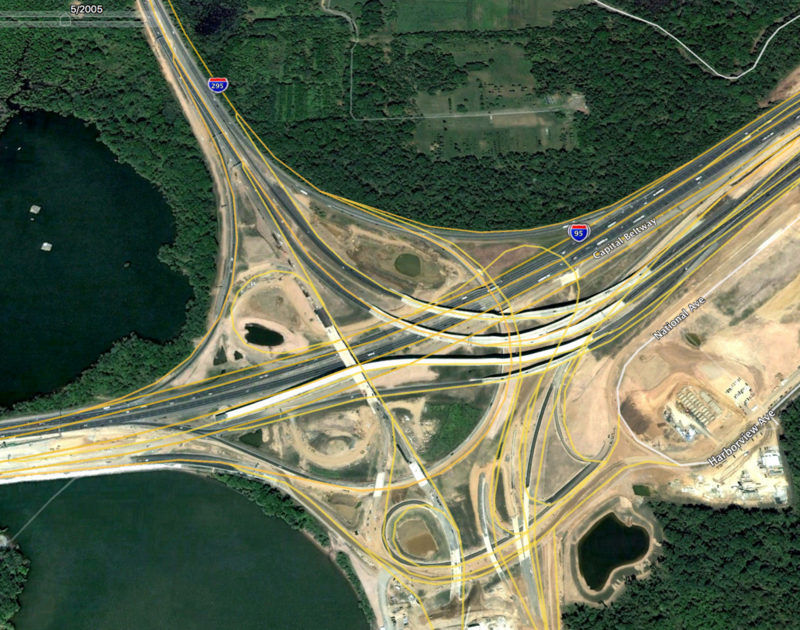 2005 aerial view of I-495 construction near Oxon Cove Park (at top). Image by Landsat, via Google Earth used with permission. That's because the infrastructure bill could be enormous. The Oxon Cove site is surrounded by expressways, a subdivision, and the Potomac River; getting tens of thousands of cars onto the site would likely require extensive reconfiguration of the complex interchange between I-495, I-295, Indian Head Highway (Maryland Route 210), and National Harbor Boulevard. That one interchange, built as part of the Woodrow Wilson Bridge reconstruction project, cost over $400 million when built in the mid-2000s. Other site improvements at Oxon Cove, which has large areas of wetlands and lacks connections to services like water and sewer lines (much less transit service), will also cost millions of dollars. 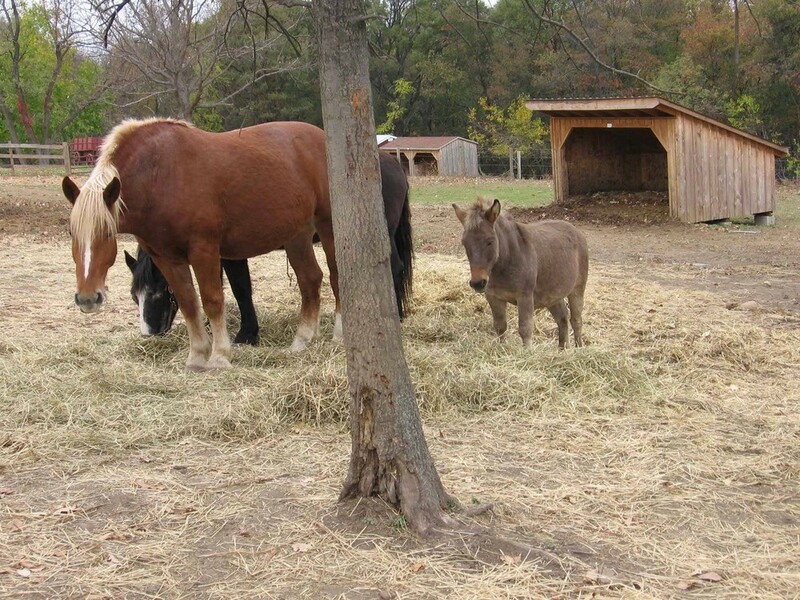 Oxon Cove Park is best known for its farm, which has been in continuous operation for two centuries. Image by NPS. An interstate compact proposed by Maryland delegate David Moon, Virginia delegate Michael Webbert, and DC councilmember David Grosso would prohibit both funds for stadium construction as well as “public funds for infrastructure improvements required by newly constructed facilities.” A similar bill failed in all three legislatures last year. Under this scheme, a local government subsidizes the stadium not with cash (although as with Maryland, infrastructure subsidies are still possible), but by giving away commercial development rights on adjacent land—a currency that only local governments can mint, and which is valuable mostly in jurisdictions like the District where new development is difficult. The practice of exchanging greater development density for community benefits is commonplace, in both DC and elsewhere, and typically goes by the moniker of “planned unit development” (PUD). A billion-dollar football stadium requires an almost unfathomable quantity of development to offset its costs. One of the few extant examples is Gillette Stadium near Boston, which pushes its fans through a regional mall's worth of retail next door. Yet Patriots Place only partly repaid the cost of the stadium; most of it was paid for directly by the team’s owner. A new NFL stadium is under construction outside Los Angeles, paid for by a large commercial development on surrounding land. Image by Phillip Kalantzis Cope licensed under Creative Commons. These adjacent developments create a strong incentive for the stadium owner to pursue only the most lucrative of all possible uses, particularly because the returns on development are less than certain. The most profitable way (short of a casino) to extract money from large crowds, as Walt Disney discovered, is a theme park. Power Plant Live! in Baltimore. Image by A. Currell licensed under Creative Commons. That’s exactly what Baltimore-based developer Cordish Companies (best known locally for Power Plant Live in downtown Baltimore and the Maryland Live casino in Anne Arundel County, but also developer of BLVD at Largo) has built at Ballpark Village in St. Louis. There, Cordish isn’t just the owner, it also operates all of the “village” venues. Needless to say, the results are mediocre. Of course, the customers of the new development will be indirectly paying for the stadium, but even people across town from the stadium will also pay via opportunity costs. The most obvious opportunity cost is that the land wouldn't be available for other purposes, perhaps less renumerative but more socially worthy. The billion dollars in private profits diverted to a stadium could instead have addressed a higher policy priority, like affordable housing; could be more publicly accessible, like parks, locally needed retail, or transit upgrades; or could have a more positive economic impact, like educational facilities. For instance, the Art Place at Fort Totten PUD includes both a new children's museum and Meow Wolf (a popular immersive art experience), a grocery store, and 141 affordable apartments. 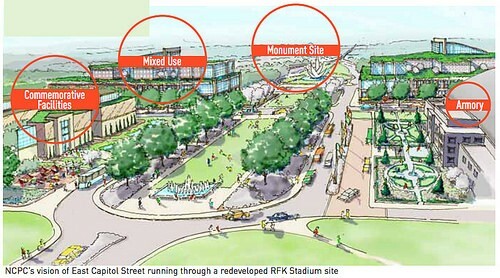 NCPC's plan for the RFK site, with private development, memorials, and museums. Image by NCPC. This opportunity cost falls hardest on residents of Hill East. Since zoning originated from nuisance law (to regulate effects from individual developments on their neighbors), typical PUD practice prioritizes public benefits that are meant to mitigate off-site impacts upon nearby neighbors. In the case of a sports stadium, the “public benefit” is of such dubious value that it exacerbates, rather than mitigates, those impacts. Another cost will fall upon businesses that those customers would otherwise have patronized. If a huge retail and entertainment precinct indeed lands at Hill East, customers might desert businesses on H Street NE. Numerous economic impact analyses have found that stadiums generally rearrange economic activity, and generate little net new activity. Instead of wasting public resources on a costly, rarely-used, and short-lived boondoggle, DC officials instead should use whatever additional flexibility they may be granted over the site for more enduring legacy. 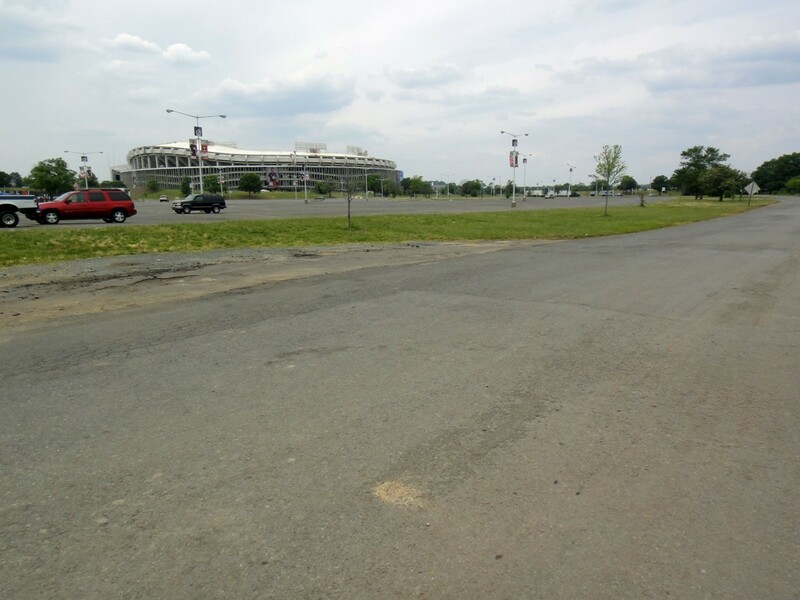 For instance, the federal government's planning agency previously recommended (PDF) pairing new development at the RFK site with a signature waterfront park open year-round, with public amenities like museums, memorials, sports fields, and an ecological park.